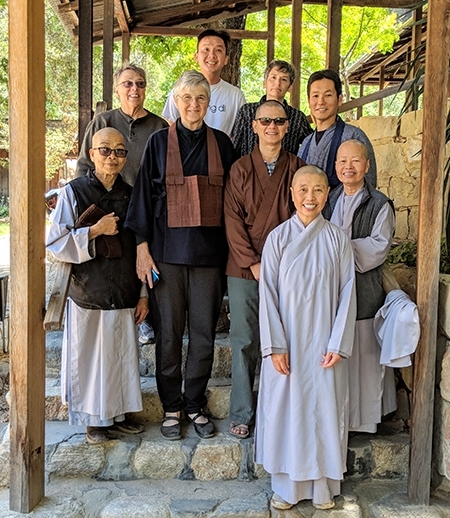 In mid-June, I was fortunate to be able to bring Ni Su Thuan Tue and her Thien Vien Truc Lam (Bamboo Forest Vietnamese Zen) contingent to Tassajara, thanks to Tanto Greg Fain’s invitation for her to offer teaching to the students. While it is traditional for Asian Buddhists to travel and visit other temples, the journey towards this particular visit began many years ago. Ni Su Tue has been wanting to visit Tassajara since she heard about it from me when we practiced together in Vietnam from 2006 to 2007. After I left Tassajara in 2005, with Blanche’s blessing, I decided to take up Daigaku Rumme’s invitation to practice with his teacher Sekkei Harada in Obama, Japan. The initial plan was to just go do an ango there in April–June 2006. However, as I had only been back to Vietnam once, and was going to be in that area of the world, I tagged on a visit to Vietnam. Hearing of my wish to visit Dalat, a city in the central region of Vietnam and the hometown of my birth parents, a Vietnamese American friend told me about Truc Lam’s five-day guest program (similar to SFZC’s). I went—intending to do five days—and ended up staying six months. This was due to Ni Su Thuan Tue’s teachings and the practice community of nuns at Truc Lam Dalat. The nunnery is part of the greater monastic communities of Master Thich Thanh Tu, the founder of Truc Lam, a revived Zen sect which had migrated to Vietnam from India in the third century. Her focus on practice as liberation through not holding to fixed views or being caught in our thinking mind, along with her calm, settled, and deep kindness was an inspiration to me. Ni Su Tue and her sister nuns (who joined the kitchen crew one day) were very impressed by the practice at Tassajara and the wondrous natural environment. 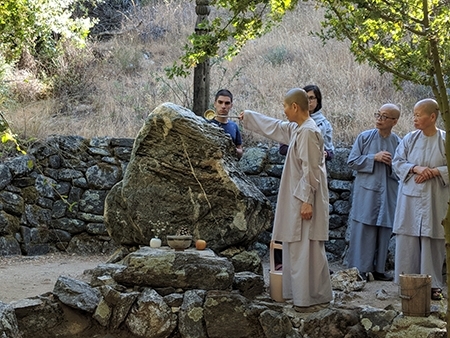 The nuns at Dieu Nanh have expressed appreciation for the teachings of both Suzuki Roshi and Eihei Dogen so, as can be seen in the photo above, our walk to and offering at the Suzuki Roshi Memorial was a highlight of their visit. Thank you to Tanto Greg Fain, Abiding Teacher Leslie James, Acting Tanto Layla Bockhorst, Director Carolyn Cavanagh, Ino Hiro Ikushima, and the staff and students at Tassajara for your welcome and accommodations in making this visit an easeful and connecting experience for everyone.